To see that this is seki under a superko rule, suppose that Black tries to play the ko. After White cannot take the ko at a because doing so would repeat the original position (with the same player to play). However, White can play . Now Black cannot take the ko at a because doing so would repeat the position after . Whoever starts the ko has to find a ko threat, so the original position is a standoff (seki). Harleqin: except if it is jigo ;). 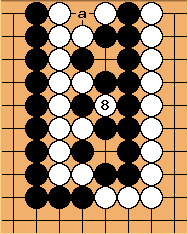 GoJaC: As an explanation of the above comments regarding Japanese rules: the way I understand Japanese rules, the "someone" that "has made a mistake" is the person that loses the game, seeing as they could play this quadruple-ko indefinitely (Japanese rules do not implement SuperKo), thereby forcing the voiding of the game through eternal life (which would be Jigo). Harleqin: I can not prove it, but I believe that under superko rules, even n-tuple kos (n=2,4,6...) behave like a seki (double ko seki is the easiest to understand) while odd n-tuple kos (n=1,3,5...) behave like a ko. In even n-tuple kos the player who moves first also has to find the first threat (a "disturbing ko" in Ing rules, see below), so moving in it has almost the same effect as filling a dame in a basic seki. Odd n-tuple kos can be fought over ("fighting kos" in Ing rules), but the taking of the ko can take n moves. The difference of Ing ko rules to superko rules is that under Ing rules the disturber in a disturbing ko may play the cycle once (thus repeating a position once) but then that area is forbidden for the rest of the game, while under superko the disturber cannot complete the cycle immediately. Bill: Historically, it was the fact that quadruple ko (in the form of two double kos) became contestable under superko (while each double ko was not) that led Ing to formulate his disturbing ko - fighting ko distinction. Bill: After analysis I believe that this is a quadruple ko death? under a superko rule. The demonstration relies upon two things. First, if Black plays first White can force Black to find the ko threats, not White. Second, when White plays first she can also force Black to find the ko threats. So White can wait until the end of the game to play the quadruple ko, run Black out of ko threats, and capture Black's stones. I. e., Black is dead. The second part is easier to show, so I will start with it. Bill: Black must reply at and because of atari. Bill: Now Black cannot reply at a by the superko rule, because that would repeat the original position. Nor can he play at because of atari. So Black must find a ko threat to continue the quadruple ko. Bill: Now, White is banned from taking at a by the superko rule. However, . . .
Bill: White can continue with . 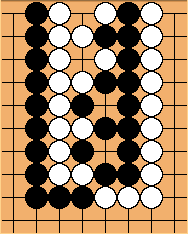 Having only one group of stones, White is not constrained like Black is. Now Black is banned from b by the superko rule, because that would repeat the position after (with the same player to play). 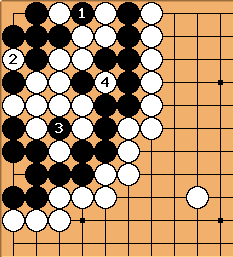 To continue the quadruple ko, Black, not White, must find a ko threat. Suppose that Black does find a ko threat. 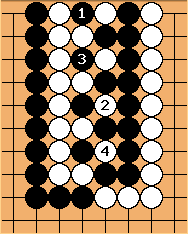 Since we are at a different position, maybe Black can force White to find the next threat. Let's see. Bill: After playing his threat Black continues the quadruple ko with . Bill: White cannot play at a, . . .
Bill: But White can play . Now Black is banned from taking the ko at a because it would repeat the position after . This position (after ) is like the original one in form, so we know that Black cannot start from here and force White to find a ko threat. So, strangely, even though the Black stones have eyes and the White stones do not, Black is dead under a superko rule. Harleqin: It is not so strange when you consider that Black is split into two groups, while White is not. It would be interesting to see how different distributions of ko "mouths" behave. Sigmundur? : Bill's fine analysis is still little better than guessing. Couldn't this kind of stuff be exhaustively searched?